A volcano is a mountain where lava (hot, liquid rock) comes from a magma chamber under the ground. When there is enough pressure, it causes the volcano to erupt. The pressure blows off the top of the volcano. The magma comes out, sometimes quickly and sometimes slowly. The lava and pyroclastic material that comes out from volcanoes can make many different kinds of land shapes. There are two basic kinds of volcanoes. These volcanoes are formed by low-silica (i.e. basic) lava. A traditional way to classify or identify volcanoes is by its pattern of eruptions. Those volcanoes which may erupt again at any time are called active. Those that are now quiet called dormant (inactive). Those volcanos which have not erupted in historical times are called extinct. An extinct volcano has not erupted in the past 10,000 years. Edinburgh Castle in Scotland is located atop an extinct volcano. The Earth's largest volcano has been discovered. It is 2km below the sea on an underwater plateau known as the Shatsky Rise. This is about 1,600km east of Japan. The previous record-holder, Mauna Loa in Hawaii, is still the largest volcano on land. The 310,000 sq km (119,000 sq mi) volcano, Tamu Massif, is comparable in size to Mars' vast Olympus Mons volcano, which is the largest in the Solar System. It was formed about 145 million years ago when massive lava flows erupted from the centre of the volcano to form a broad, shield-like feature. That suggests the volcano produced a flood basalt eruption. ↑ The plural of volcano can be either volcanos or volcanoes. Both are equally correct, and it is not a matter of British vs US spelling. Oxford English Dictionary. Spelling in any particular Simple page tries to be consistent. ↑ 2.0 2.1 2.2 Earth Science. Austin, Texas: Holt, Rinehart and Winston. 2001. ISBN 0-03-055667-8 . ↑ "Garibaldi volcanic belt: Garibaldi Lake volcanic field". Catalogue of Canadian volcanoes. Geological Survey of Canada. 2009-04-01. http://wayback.archive.org/web/20090626082839/http://gsc.nrcan.gc.ca/volcanoes/cat/feature_garibaldi_e.php. Retrieved 2010-06-27. ↑ 5.0 5.1 5.2 Ball, Jessica (September 8, 2010). "Voices: Dead or alive ... or neither? Why a dormant volcano is not a dead one". Earth Magazine. 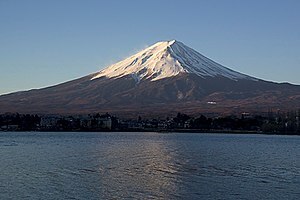 http://www.earthmagazine.org/article/voices-dead-or-alive-or-neither-why-dormant-volcano-not-dead-one. Retrieved 14 August 2012. This page was last changed on 20 August 2015, at 23:30.